As a men’s UK style blogger, I am always looking to branch out into new clothing choices which are uniquely different from what I would typically wear. For this outfit, I took a gamble on some new trousers for something uncommon compared to my usual streetwear ensembles. Read on for more! 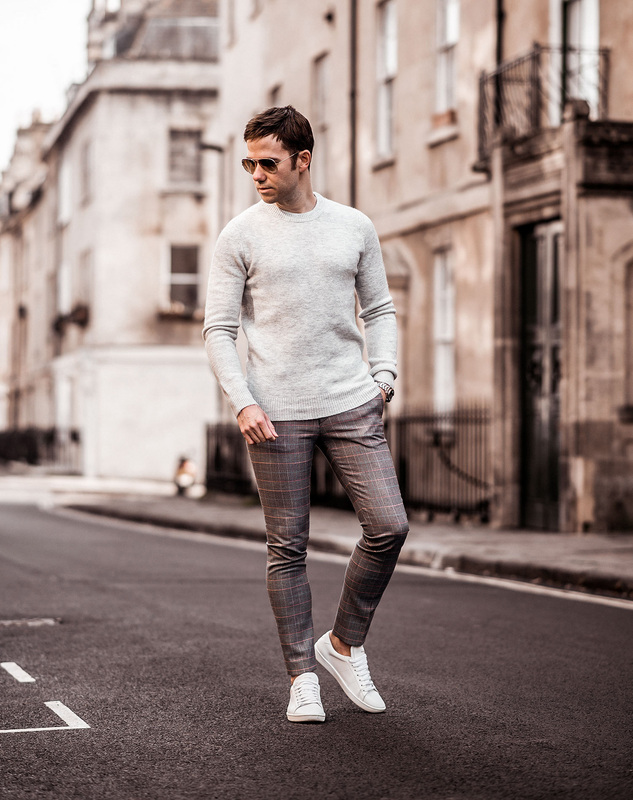 Fashionable skinny fit trousers are not a new trend, in fact, printed, patterned and check slim fit pants have been popular for the last couple of years. Even so, it seems that more and more men are daring to wear some very outlandish trousers! Initially, I was wholly disinterested with the look, but over time I have come to admire this quirky style. When browsing for the ideal pair of trousers which would be the gateway into this fashion trend, I came across this beautiful pair of fine check print skinny trousers in the Topman store. Usually, it takes a lot for me to try on clothing in a store; I much prefer to shop from the armchair in the comfort of my own home. However, seeing them presented on the mannequin persuaded me to break with tradition and give them a whirl in the changing room! Once on, I was suitably impressed, and I even purchased them there and then (shocking turn of events!). However, despite all this backstory concerning my love of those trousers, the ones in these photos are a completely different pair (In fact, the ones my story revolved around have not even been worn outside yet, very typical of me). The trousers shown in the accompanying photos were purchased a week later online (still from Topman) but I was equally enthralled with their style, maybe even more so and is the reason I wore them first. For the rest of my outfit, I picked out a creamy beige toned sweater from ASOS which paired beautifully with the multi-tonal threads of the skinny trousers. 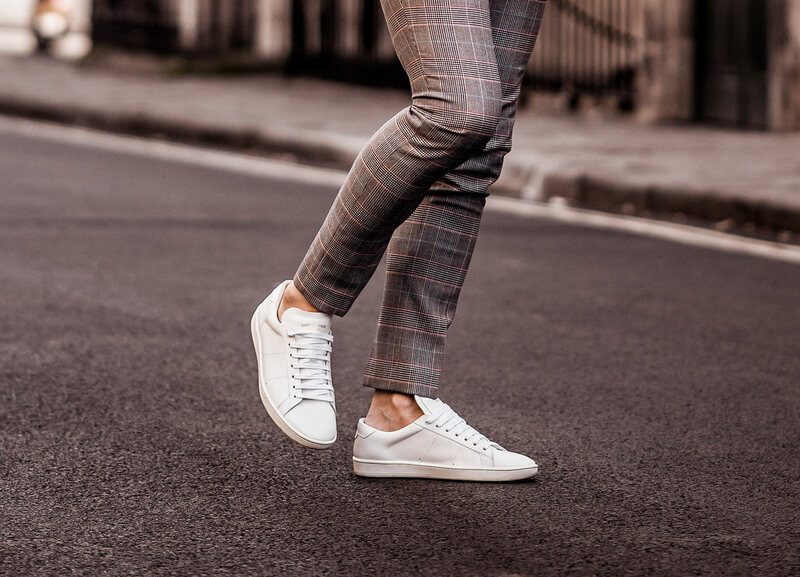 I wanted to keep the look slightly causal, so I opted for my trusty Saint Laurent Sneakers (easily my most worn pair of shoes). With the sun beginning to feature more regularly for us UK dwellers, I went prepared with a pair of my Ray Ban Aviator sunglasses (first time this year!). 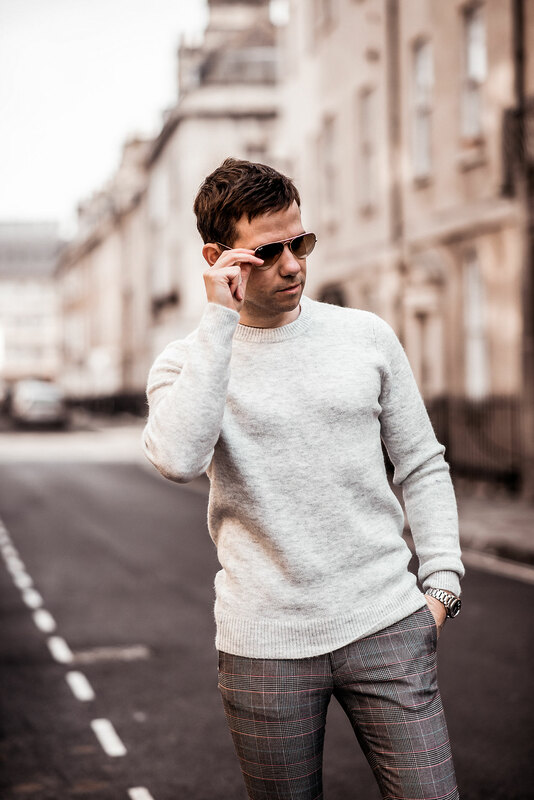 For the location, we decided to plan ahead somewhat, dropped off in the city of Bath very close to the Apex Hotel, boasting a number of useful side streets which by and large are mostly empty, an in invaluable trait when attempting a photo shoot. As we predicted, we managed to get the images taken without any interruptions; even traffic was at a minimum. Overall, a very successful shoot and completed very quickly too! What did you think of my latest outfit? 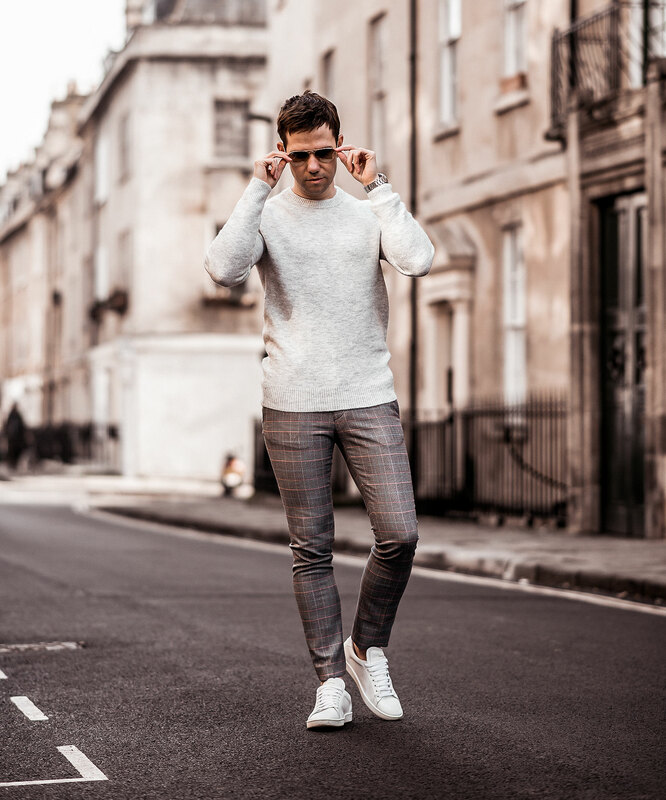 Are you a fan of the patterned skinny trousers trend which can be seen in every men’s clothing high street store across the UK? Please let me know in the comments below! * This post contains affiliate links to help keep the site running. Asos also sells nice dress pants with extreme skinny fits. Maybe you should check them out too. Thanks for the tip, I’ll take a look at there stuff!